Add a little zing to your entrees with this super easy, light and zesty side salad. This salad is made with a savory spring mix and tossed with juicy, bright orange slices, tangy pomegranate dried cranberries, and crunchy toasted pecan halves. A sprinkling of shaved Parmesan cheese adds a surprise piquancy and the orange flavor is intensified with a scattering of orange zest. A drizzling of raspberry-pomegranate dressing perfectly completes the salad. Delightfully refreshing, this salad is an ideal accompaniment to your summer meals. Add chicken or turkey for a complete light lunch or dinner. Also, this dish especially complements spicy entrees. It was a big hit at our Fourth get-together, and I know you'll enjoy enjoy it as much as we did...make it for your next take-along! Zest one of the oranges and set aside. (You can zest the other orange and freeze the zest for future use, if you like.) Cut the peel from the oranges and slice into about 1/4" wheel-shaped pieces (save any accumulated juice). Reserve about 4 whole slices for garnish and separate the remaining slices into sections, carefully removing any center pulp. Place the salad mix into a large serving bowl. Sprinkle with the dried cranberries, pecan halves* and Parmesan cheese. Add the sliced orange sections and sprinkle with the orange zest. Add salt and pepper to taste. Pour any accumulated orange juice onto the salad. Lightly drizzle the dressing over the salad, just enough to coat, and gently toss. Garnish with the whole slices of orange. You can dry-toast the pecan halves in a small saute pan on medium heat for a couple of minutes, tossing occasionally until lightly browned and fragrant. Enjoy as a side salad or add sliced grilled, roasted or baked chicken or turkey for an entree. Makes an ideal side salad to mellow out spicy entrees, such as my Asian-Inspired Crunchy Orange Chicken. Thanks Regina...yes, adding chicken or turkey will make it a great entree also! If Kenny doesn't care for pecans, he'll still enjoy this salad...stay cool! Pomegranate is a fruit I first tasted when I came to America from Ireland, and I must admit I love it. This salad looks so simple and delicious, and just perfect for summer days. This looks amazing, healthy and so refreshing, Bon. On my list of summer salads :) Sending you an email tomorrow! Thanks Lisa...I know you'll love it! I'll look for your email! @Melissa and Mairead, Thanks so much for your kind comments. It is an ideal summer salad and so easy! Enjoy! Bonnie, this sounds like something I should be eating today! But I'll need a few things from the store, so ... Oh well, another day! Thank you Jean...will be just as good another day...enjoy! Such lovely flavors and textures here! 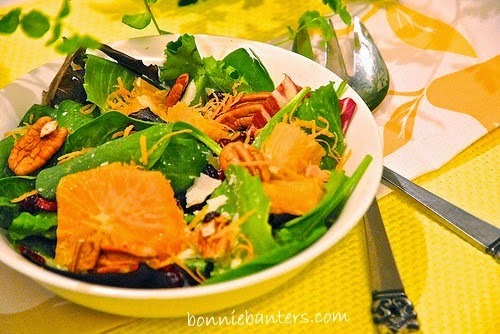 This looks like the perfect summer salad, Bonnie! Thanks so much Monet...refreshing and laid back, just as summer should be...enjoy! Thank you Liz! Yes, this salad is a great way to cool off during these hot, muggy days...enjoy and hope you have a wonderful weekend as well! This is my kind of salad! I was pretty much born eating oranges and love it everywhere! Perfect salad to serve on a warm summer evening.